The Stingeries: Twin Tuesday: Identical or Fraternal? The most common questions we've been asked when someone hears we are having twins are (1) Do twins run in your family? and (2) Are they identical or fraternal? I spoke briefly about the difference in this post since a lot of the information was new to us as well and we had just started reading up on twins. I've since joined a couple Facebook groups for twin moms and came across this great chart which shows the different kinds of fraternal and identical twins. I found it to be super helpful! Since you may have seen in our gender reveal that we are having two girls, there is no definitive way to tell right now if they are identical or fraternal. 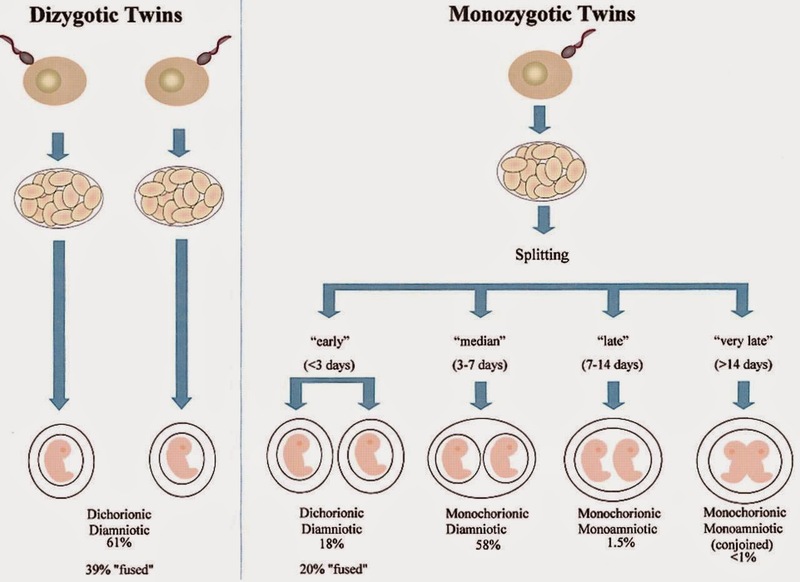 Most likely though, they are fraternal - dizygotic dichorionic diamniotic twins (say that three times fast!) to be exact.